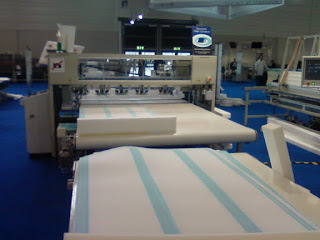 The Gribetz GB-1 Glue Bridge previously announced at Interzum is a great machine for layered foam mattress beds and foam encased units as well. This new Gribetz GRS-1 foam rail splicer machine can make your foam encased operation even more efficient. The GRS-1 automatically accepts various lengths and adheres them together with other odd sized scraps to form full length sections. Use everything you pay for! You can eliminate waste by cutting foam encased rail pieces as you need them instead of stockpiling premium priced pre-cut sizes. 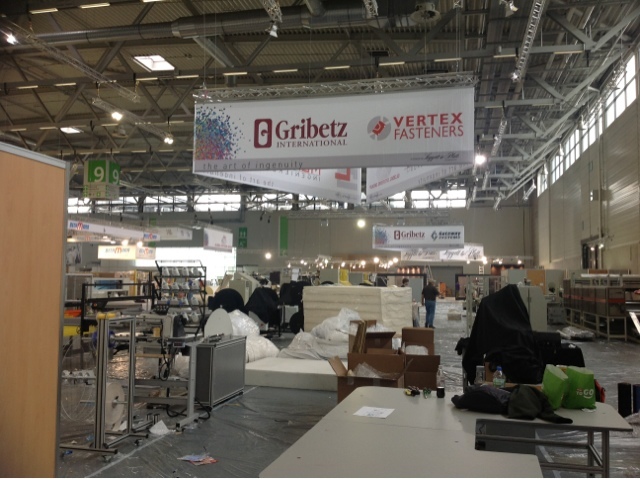 The new Gribetz GRS-1 is one more innovative machine that improves your profitability on many levels of lean! Research & Development teams from GSG and SABA have created a unique, new automatic water-based adhesive system. It utilizes new SABA Hybrid 13.0 Series adhesive and patent-pending application heads that transfers adhesive with virtually no overspray. 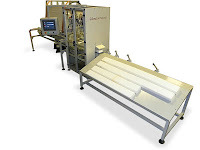 The Gribetz GB-1 is a great automatic system that controls adhesive material and labor costs by applying a consistent amount of material in a regulated fashion. This ensures every unit has equal amounts of adhesive and quality. It's ideal for foam encased beds or laminated foam units.The SABA Hybrid 13.0 Series material creates a near immediate bond for workplace handling. Ok - now it's starting to look like a machinery show booth! This space will be transformed into the bedding industry's biggest single display of state-of-the-art machinery technology. GSG will demonstrate equipment for nearly every function of your mattress factory. Best of all, there will be some ground-breaking technology for hot new markets introduced in the Global Systems Group booth. I'll share much more about that 72 hours from now. 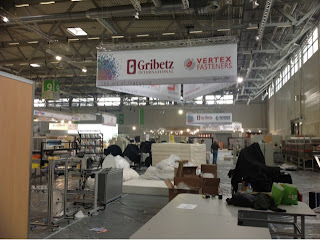 It's early in the construction of the GSG booth at Interzum. It's not much to look at, but some readers may be interested in comparing this early view with the final view of the booth they will see once they visit the stand (Hall 9, C020). 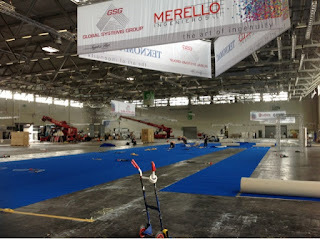 Of course we all need to start somewhere, and if you are looking for more profitable mattress manufacturing, start with a trip to the GSG booth at Interzum 2013. One thing this picture definitely lacks is machinery! This GSG booth is going to be packed with new equipment so you can review everything you need for mattress production here at the GSG booth at Interzum.